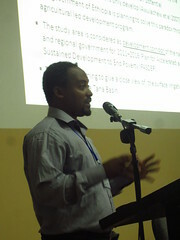 The Nile Basin Development Challenge (NBDC) is coming to an end in late 2013, as will all Basin challenges of the Challenge Program for Water and Food (with the exception of the Ganges basin for another year). The Nile Challenge has generated many rich experiences that we hope will be taken up by CGIAR research programs (such as ‘Water Lands and Ecosystems‘ and ‘Integrated Systems for the humid tropics’). A dinner for very important persons (VIP) organized on 14 November to discuss the eight key messages developed by NBDC. A ‘Knowledge Watershed’ event at the ILRI campus on 15 November to look at past achievements, current observations and practices and possible next steps. The VIP dinner was organized with 30 experts in land and water management in Ethiopia, including the State Ministers for agriculture, energy, water resources, and representatives from the World Bank, the Ethiopian Institute for Agricultural Research etc. The dinner was squeezed between presentations of the eight key messages. The messages were presented in two batches of very short and compelling presentations, interspersed with the different courses of the dinner. The invited guests provided some insights about the key messages and were networked ‘in a different way’. An experience appreciated publicly by one of the state ministers and likely to be followed again for other programs. The Knowledge watershed was run the next day as a sort of share fair with about 80 participants spanning partner organisations and important actors in land and water management. An initial open mic session invited all participants to share what they considered major achievements of the NBDC. Then the eight key messages were presented and discussed around ‘scale stands’ representing the local (woreda/district), regional (sub-national) and national levels. The Knowledge Watershed ended with a talk show inviting participants representing partners at woreda, basin authority and federal level to discuss next steps and what would happen ideally if a ‘new NBDC’ was to take place. The final cocktails allowed further networking and public thanking for all the actors that contributed to NBDC in the past years. Today in Addis Ababa the International Water Management Institute (IWMI) hosted a learning share fair on agricultural water management. 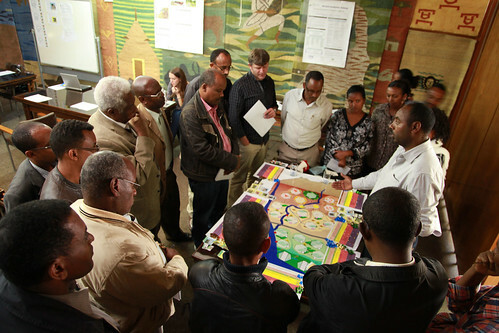 It was designed to celebrate 10 years IWMI engagement in Ethiopia and East Africa and to link with World Food Day and a series of meetings of the CGIAR Research Program on Water, Land and Ecosystems. Approximately 100 people from Ethiopia and beyond congregated in the plenary tent on the Addis Ababa campus. First on the agenda: a retrospective on IWMI in East Africa. Doug Merrey, first IWMI Director for Africa explained how the East Africa office in Ethiopia grew out of discussions in early 2000, a December 2002 national workshop bringing together all agricultural water management actors in the country, and resulted in an IWMI agreement with the Ministry of Water in 2003. Key elements in the establishment and subsequent operations of the office included a strong IWMI partnership with the International Livestock Research Institute (ILRI) as well as evolving partnerships with the Ministry of Water initially, then with the agriculture ministry, research organizations, NGOs, universities and other organizations. 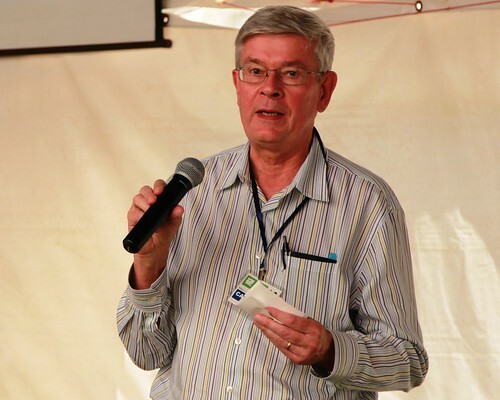 After this brief historical retrospective, Simon Langan, Head of the IWMI East Africa office also reported on IWMI achievement in the past 10 years. Second, he highlights the publications – reports, papers and books – produced by the office as a contribution to the evidence base for agricultural water management practice and decision making. The tally includes 8 books, 83 journal articles, 104 proceedings and many policy briefs, investment briefs and research reports. Third, he pointed out some capacity building dimensions of the work of the office: More than 80 MSc students, 11 PhD students, several interns and 6 postdoctoral fellows supported through various projects. Fourth, he highlighted the importance of partnerships – across CGIAR centres, with the Ministry of Agriculture, the Nile Basin Inititiative, the Global Water Initiative and with universities. Nile Basin Development Challenge experience in Ethiopia shows that natural resource management (NRM) requires multi-sector integration and the strong involvement of farmers to identify problems and implement solutions. However, research shows there is a ‘disconnect’ between farmers and decision makers in their perceptions of NRM problems and ideas for solutions. Participatory tools – such as ‘WAT-A-GAME‘ that can be used to encourage better communication and joint understanding among different actors are essential for successful planning processes. NBDC researchers, in collaboration with the AfroMaison project and local partners, have been experimenting with the WAT-A-GAME tool in Fogera, Ethiopia. 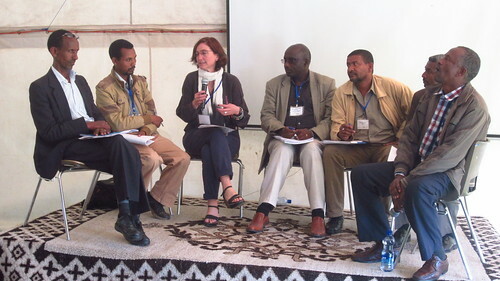 In February 2013 a ‘learning event’ was organized to present the tool and experiences from Fogera woreda to an expert group of regional and national partners. The participants included representatives from the Ministry of Agriculture, the Ethiopian Insitutue of Agricultural Research, OXFAM- African Climate Change Resilience Alliance, Forum for Environment Ethiopia, Ethio Wetlands and Natural Resources Association, Horn of Africa Regional Environment Centre, Ethiopian Evangelical Church Mekane Yesus, Ethiopian Rainwater Harvesting Association, World Vision Ethiopia, Hundee-Oromo Grassroots Development Initiative, Fogera Woreda Livestock Agency and SOS Sahel Ethiopia. The aim of the event was to discuss the tool and its potential use in supporting landscape scale strategy development for integrated NRM at a larger scale. Participants played the game using two similar game boards designed for the Fogera landscape. Seven volunteer participants from each group represented the farmers living in the highland, mid-land and wetland areas and also a landless farmer. Does ‘landscape’ mean the same as ‘watershed’? Were users surveyed before and after they played the game? What time framework is involved in playing the game? Participants gave constructive feedback on the game itself and how to make it useful for other organizations and experts working in the area of NRM. All agreed on the need to simplify the tool and called for further research to investigate ways in which the tool could be used to complement current government approaches towards watershed management. They also suggested that community level representatives should be grouped by gender and that land management strategies should be developed separately to ensure that women’s views are recognized. More generally, playing the game stimulated a discussion around different approaches towards integrated planning of NRM used in Ethiopia. It seems that most of the approaches in the past lacked genuine community participation and they failed to create a sense of ownership. At the learning event it was agreed that the WAG tool could usefully complement ongoing watershed management planning and implementation. Participants also felt that the role playing element would help communities better understand their problems, from household to landscape levels, and give them an opportunity to identify potential solutions from their own perspectives. The game also presents an opportunity for decision makers to better understand the challenges facing communities in the implementation of NRM interventions. Some participants showed interest in taking and adapting the tool to their own organizations and programs. However, a simple set of guidelines is needed to explain how to design the game board for a specific landscape and then to use the game effectively to reflect and address different actors’ views. This will help the scaling up of the tool by other organizations. In-depth training is also needed for organizations that are interested to use it in their project sites with necessary documents and materials. 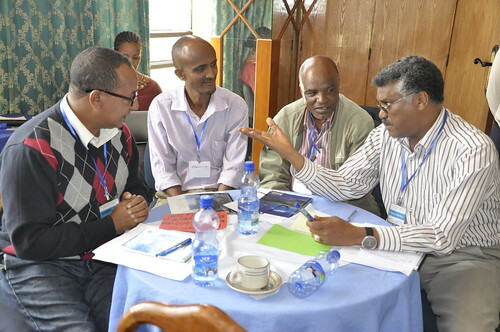 On 21 May, the International Fund for Agricultural Development (IFAD) convened a sharefair to share lessons, identify promising solutions and ultimately improve the impact of investments in water in the Ethiopia country program. The NBDC team also helped organise this special event.